Our best-selling West Rim airplane tour is ideal for Las Vegas visitors looking to sample the best the Grand Canyon has to offer in the fastest way possible. This flight leaves from Boulder City airport and cruises over Lake Mead, a sparkling blue oasis situated amid dormant volcanoes and the arid Mojave Desert. Then it’s onward to Hoover Dam, a masterpiece of American engineering. It’s at this point that you get a true sense of the Colorado River, one of the West’s major waterways (it flows 1,200 miles from the Rocky Mountains in Colorado down to Mexico!). And don’t worry about the details – your pilot will announce such sights. Next you’ll be over the Grand Canyon. This is signified when you cross majestic Grand Cliffs Wash, the narrowest region of the National Park. The setting gets incredibly dramatic as you fly over flat plateaus, the gorge (up to 1 mile deep!) and the River. The flight back to Vegas starts once you see the Grand Canyon Skywalk, the glass bridge that’s been visited by millions of visitors from around the world; if you’ve booked the last flight of the day, you are in great position to see a stunning sunset. Pick up time is 1.5 hours prior to flight time. Check in is at the Boulder City Airport, which is about a 30-minute shuttle ride from Las Vegas. Boarding time is 10 minutes before take off. Then we quickly reach cruising altitude and fly over Lake Mead, Hoover Dam and the Grand Canyon. The West Rim is just 120 miles from Las Vegas and airplanes can reach it in 30 minutes. Actual flight time is 1 hour. Upon return, exit aircraft, transfer to motorcoach and return to your Las Vegas hotel. 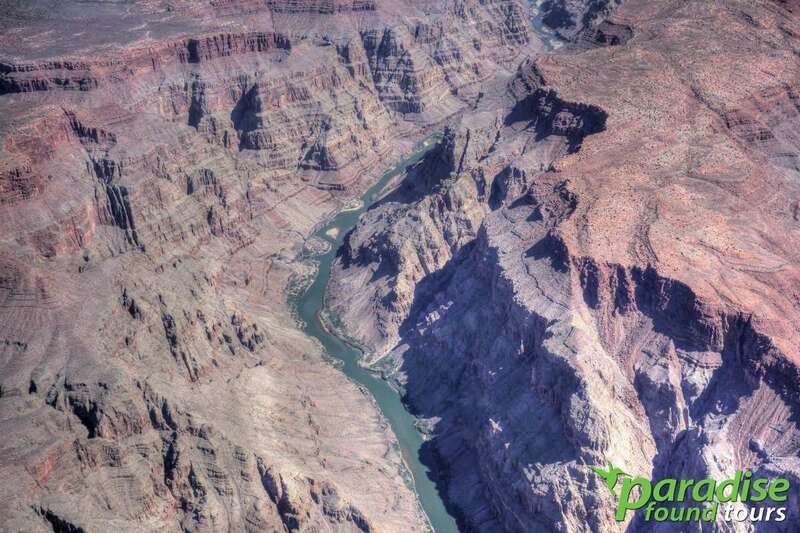 Aerial sightseeing tour from Boulder City (30 minutes from Las Vegas) to the Grand Canyon’s West Rim and back. Free hotel pick up & drop off. Please indicate where you are staying when you book tour. Superior views of key sights including Lake Mead, Hoover Dam and the West Rim. Safe, custom aircraft replete with incredible climate control for your comfort. Spacious oversized viewing windows so you get enormous views and great photos. Access for personal camcorder hook up to flight tour narration. Only the safest FAA certified flights for your safety. Special commemorative flight certificate upon request. Personalized photos are also available at extra charge. Hotel Pickup: Our West Rim Air trip includes free pick up and return at your Las Vegas hotel. No pick-ups are available in the Summerlin area. Tour Length: Total tour time is approximately 3 hours from hotel to hotel. *Our service providers reserve the right to substitute air craft based on operational needs (i.e. off-season, maintenance etc.) Tour itinerary, tour components and prices are subject to change at any time without notice for reasons that may include weather conditions, FAA restrictions, and/or any other unforeseen occurrences. This flight sells outs. Avoid last-minute bookings. Reserve at least 2-3 weeks ahead of time. Children 2 years of age and under are free but must fly on the lap of their parent or guardian and use proper safety restraints. If you’re child is older than 2 than s/he must purchase a regular-fare seat. Photography is permitted from inside the aircraft but only upon pilot approval. Photos during flight are for non-commercial use only. If you are looking for commercial use, we recommend that book a charter flight.